Hiring? Toptal handpicks top business plan consultants to suit your needs. Ray Dalio is the 68-year-old founder of global investment management firm Bridgewater Associates, the world's largest hedge fund. Born in Queens, New York in 1949, Dalio graduated with a finance degree from Long Island University (CW Post) and an MBA from Harvard Business School. Dalio's net worth is estimated at $17 billion as of the authoring of this article, making him the 54th wealthiest individual in the world. Dalio resides in Greenwich, Connecticut with his wife, Barbara. Bridgewater Associates is a global-macro hedge fund founded by Ray Dalio in 1975. It manages $160 billion on behalf of 350 of the largest and most sophisticated global institutions, including global pension funds, university endowments, foundations, central banks, and foreign governments. Bridgewater is one of the early pioneers of big data, machine learning, and algorithmic programing techniques, which it uses to create economic machines. An "economic machine" is a term proprietary to Bridgewater that describes the reduction of complex economic systems into interdependent stocks and flows, underpinned by cause and effect relationships, around which the firm trades. Bridgewater pioneered both the alpha overlay and risk-parity approaches to investing/portfolio management, strategies leveraged by its Pure Alpha and All Weather flagship funds, respectively. In 2006, the firm transitioned all its clients into its alternative strategy funds, thereby eliminating the traditional investment approach from its portfolios. Bridgewater is headquartered in Westport, Connecticut, employed 1,700 employees as of the authoring of this article, and has been closed to new investors since 2006. What are Ray Dalio's Principles? Principles: A published compilation of Dalio's life and work principles, philosophies, lessons, and reflections, aggregated over his 40+ year career. Principles is mandatory reading for all Bridgewater employees, and serves as a guidepost for all decision making during their tenure at the firm. Idea Meritocracy: An environment and decision-making framework where investment ideas are weighed in proportion to their merits only, with no consideration to rank or title, such that the best ideas always find their way to the top. Radical Truth and Transparency: A culture of open communication and often disagreement between colleagues, whereby critical feedback on performance, shortcomings, ideas, and broader failings are unsentimentally shared and recorded, always in the presence of the recipient. Continuous and Systemized Improvement: A deliberately designed and self-perpetuating process that ensures the continuous improvement of all of Bridgewater's resources, both machine and human, to the ends of improved decision-making and investing outcomes. …but with the obvious is exactly where I’ll begin. Ray Dalio is rich—fabulously rich; he is also famous, and has been for a while—ever since he called the 2008 financial crisis and masterfully steered his fund to a 14 percent gain where his rivals averaged -30 percent for the same period. But being rich and famous, in context, seems just rewards for a life well spent: a life spent building an institution of such substance and value as he has with Bridgewater Associates—the world’s largest hedge fund. Today, Bridgewater manages $160 billion on behalf of 350 of the largest and most sophisticated global institutions, including pension funds, university endowments, public and private foundations, central banks, and foreign governments, and is considered to be one of the most successful investment managers of all time. Let’s be honest, though: There is nothing especially unique about building something “big and bad” as a member of the world’s billionaires club. To the contrary, others, such as Jobs, Ortega, Dangote, Arnault, Son, Musk, and Ma have done so with far more flair, flash, and pizazz than Dalio has. What sets Dalio apart, however, is that few in history have so successfully built two disparate organizational types in tandem, established cultures and priorities unique to each, and scaled them up as one. In Bridgewater, Dalio has built one of the world’s preeminent investment houses, delivering best-in-class returns more consistently than any other hedge fund in history, while also systematically building one of the great people organizations of our time. I am here to debate that Ray Dalio accomplished these great feats by adhering to a few of what I call, business’ first principles; principles that have long since been distilled by better minds into practical frameworks universally applicable to every venture type ranging from mainstream startups to abstruse investment vehicles. This article will highlight a number of these frameworks and illustrate how Ray Dalio successfully leveraged them to effectively build a financial services and early-fintech behemoth. In 1975, Ray Dalio founded Bridgewater Associates out of his two-bedroom apartment in Manhattan. He did so without funding, credibility, or status, but simply with a plan, an enthusiasm for the markets, and an eye for reducing complex systems into simple cause and effect relationships. He would start small; he would bootstrap. At launch, Dalio faced two challenges common to most first-time entrepreneurs. The first was a credibility gap—a phrase coined in 1965 by the New York Herald Tribune, and most relevant to Dalio’s early fundraising efforts. The second challenge was his go-to-market strategy decision, which stands as a representation of our first universally applicable framework. Paraphrasing organizational psychologist and Wharton professor Adam Grant, credibility lies at the intersection of two socio-anthropologic dimensions: power and status. Power involves the authority to influence others, while status involves the accordance of respect by others. Any attempts by one to exert power (i.e., influence) without status—for example, attempting to fundraise, pre-revenue, or without a track record—typically ends in failure, as was the case for not just our 26-year old Dalio, but also for many a first-time founder struggling to find his/her feet. Thus, as part of the crafting process for his go-to-market strategy, Dalio would outline and answer a series of questions that would pave the way for the establishment of his track record, thereby solving his status—and thus credibility—issue. The questions were as follows: First, what am I good at today, but could become best in the world at tomorrow? Second, what problem am I out to solve that the market also finds valuable? Third, what form should my solution come in, and how will it be different from substitutes? Fourth, how will I price this solution? And fifth, who will my customers be; how will I reach, engage, and communicate with them? 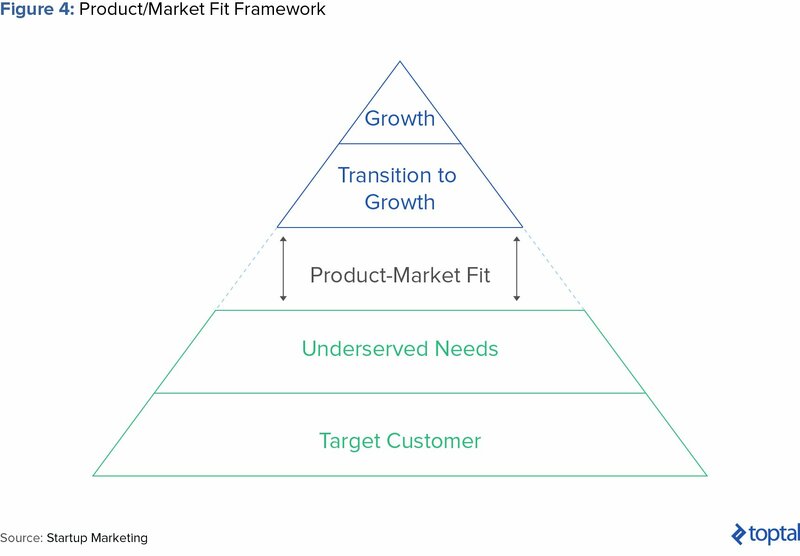 A go-to-market (GTM) strategy, as implied by the five questions above, is a pre-launch blueprint for how new ventures reach their desired customer and price and distribute their chosen product or service, achieve early adoption, and establish advantage. 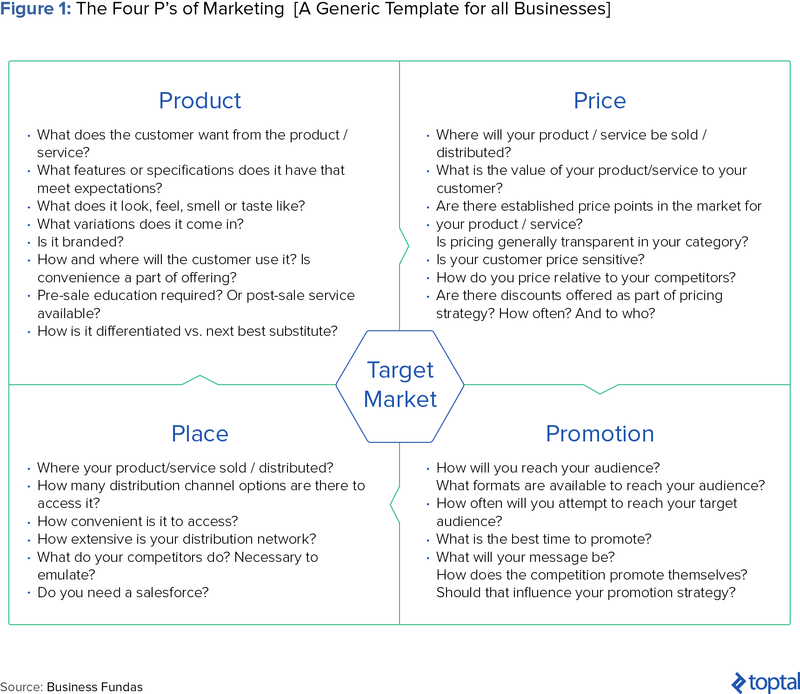 Robust GTM strategies typically take into account our second universally applicable framework, the “Four P’s” of Marketing: Product, Price, Place, and Promotion. From the onset, Dalio was clear about his strengths and where he would likely have an edge—in “visualizing, reducing and synthesizing complex systems into interdependent stocks and flows, underpinned by cause and effect relationships;” relationships that he translated into “rule-based and time-deterministic” quant models that mathematically reflected what he called “economic machines” or “machines”. With clarity about his strengths, Dalio then decided that his value-delivery vehicle would be an advisory practice that managed risk exposures [on behalf of clients] while also offering advice and market observations. Further, he would price these services on a success-fee basis, i.e., a back-end weighted pricing strategy I would recommend to any new market entrant seeking to gain share by reducing the cost barriers to adoption for prospective/new clients. With his product and pricing strategy cemented, Dalio now had to settle on an entry market/niche with which to establish a track record. He chose the livestock, meats, grains, and oilseeds markets, which, by my analysis (hindsight bias notwithstanding), were ideal for three reasons. First, these markets were closely correlated. My attempt at making sense of this is as follows: Livestock eat quantifiable amounts of corn (grain) and soybeans (oilseeds) before ending up on the butcher’s counter as meats; corn and soybeans compete for acreage, rainfall, and fertilizer input (all quantifiable on a yield basis), as well as share harvest cycles. Over specified time periods, planted acreage, rainfall (measured per week, per major U.S. growing area), and fertilizer input translate into predictable harvest sizes and carrying costs over set distances. Data which, when married with livestock inventory levels by age, weight group, location, and rate of weight gain, determine the quantity and velocity of grain feed consumption. Superimposing these correlated datasets upon retailer margin, consumer preferences (i.e., meat cuts), and slaughterhouse capacities allowed for detailed regressions and other analyses to be run, which Dalio did to the ends of programing a proprietary system of “machines” for his market. These machines would then have produced the pricing predictions he went on to successfully trade around. The second reason why the livestock, meats, grains, and oilseeds were a great launch market for Bridgewater is that these markets were less sensitive to speculative and sentimental market distortions relative to public securities markets; another attribute that dovetailed nicely with Dalio’s strength of reducing complex systems into simple economic machines. The third reason for choosing such niche markets to go to market with is in line with our next time-tested and frequently championed business principle: Where possible, entrepreneurs should launch into small, niche, sparsely-understood markets and establish monopoly dominance before commencing with expansion. Expansion under this model subsequently leverages either the established NewCo’s brand reputation and strategic competence to grow into related markets/verticals or leverages its existing assets and infrastructure to sell new products to the same set of customers. So, just as Amazon began with books, Google with search, and Facebook with Harvard students, Bridgewater began with livestock, meats, grain, and oilseeds. The final piece to Bridgewater’s GTM strategy/launch business model was Dalio’s plan for reaching, engaging, and communicating his services and successes to his clients. In this regard, Dalio settled on a low-cost strategy still very much mainstream today—the newsletter. Every day for the better part of ten years, Dalio telexed his Daily Observations—a research circular that detailed his market analysis, observations, and risk management techniques—to a growing expanse of clients; a strategy that eventually won him inbound mandates by the McDonald’s Corp, Kodak’s Pension Fund, and the World Bank, and cumulated in his first turn of outside capital. Paraphrasing an adage from Toptal Finance Expert Alex Graham, “just because you build it doesn’t mean they will come.” Novice and experienced business folk, obsess about marketing. In 1985, Bridgewater raised its first $5 million of outside capital, formally marking its transition to the Bridgewater we know today—i.e., a hedge fund. To be successful in this new phase, Dalio’s company would require a very different sort of organizational structure, composition, and strategy vis-a-vis the Bridgewater of years past. Most importantly, and in line with our fourth foundational business framework, Bridgewater would require a fully congruent operations strategy. 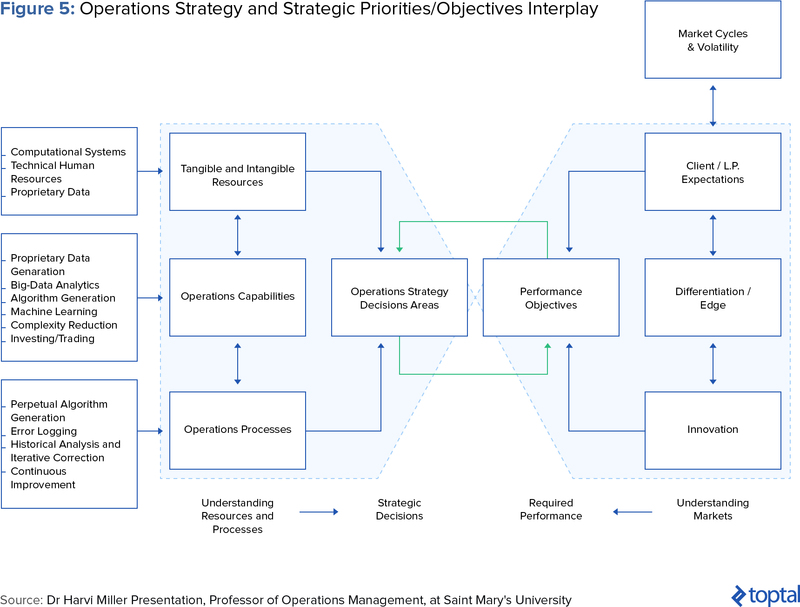 An operations strategy is a unifying framework that steers the total pattern of decisions shaping an organization’s long-term capabilities toward a singular, coherent strategy. Or, as defined by Harvard Business School Professor Gary Pisano, an operations strategy is a consistent and comprehensive set of operating policies specifying how an organization will arrange its resources, priorities, and processes (RPPs) to achieve its most important strategic priorities. To accomplish the task of designing a new operations strategy, Dalio, as has every entrepreneur that has ever crossed the chasm into mass-adoption and scaling, would first need to redefine the problem he was out to solve (i.e., the job to be done), and on the back of that establish his firm’s strategic priorities. 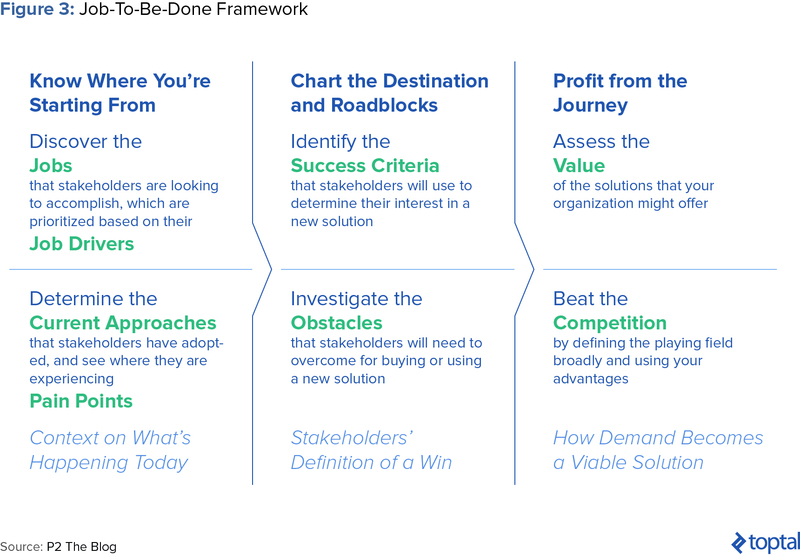 Introduced by renowned scholar and Harvard University professor Clayton Christensen, the job-to-be-done framework is one designed to root out the fundamental problem that a given customer needs solved as a going business concern. It wasn’t until he suffered a series of almost insurmountable losses that Dalio pivoted for a final time toward his true proposition. This proposition was to use proprietary data systems to continuously react and trade on real-time market information without trying to predict where the market would go. He would do this by building a unified “economic machine” powered by tens of millions of discrete datasets which he passed through real-time indicators that tested for shifting fundamentals. Finally, he would sieve his results through a different system of trend filters designed to confirm/reject price movements based on consistency with past outcomes. The ultimate objective of all this—accomplishing Bridgewater’s true job to be done: generating best-in-class risk-adjusted returns on behalf of its limited partners. An ancillary but critically important benefit that also came of Dalio’s early failures (as he iterated toward product/market fit), was his insight into Bridgewater’s greatest threat: human fallibility; fallibility which frequently came in the form of ego, hubris, imperfect recollection, inadequate mental processing, imperfect programing, negligence, and error, and came embodied in his people. These perspectives, on both the job to be done and on the business risks, enabled Dalio go on to build a truly cohesive and self-reinforcing operating strategy, complete with both offensive and defensive capabilities, and the appropriate RPPs to boot. On “offense”—i.e. Bridgewater’s strategy of trading real-time data and information to generate best-in-class returns, Dalio would devise and integrate a new set of proprietary systems to map his economic machines. Long before “big data” and “machine learning” became mainstream, Dalio recognized the inherent advantage in investing in powerful computational systems, which he complemented with a team of technical and doctorate-level statisticians, economists, econometricians, computer scientists, machine learning and big data experts, and in so doing quietly became one of the earliest adopters of big data strategies and machine learning. He was likely one of the earliest fintech companies. To reinforce his resource investments (both machine and human), and to further his drive toward achieving his strategic priorities, Dalio also designed strict processes to ensure the perpetual improvement of his system, thereby closing the loop on the RPP framework introduced above. He did this by mandating the following: Every time he or his team made an investment decision, the criteria would be translated into rule-based algorithms, tested against historical data (sometimes going as far back as a century) and retroactively simulated against known outcomes. The algorithms associated with sub-optimal outcomes would then be sequestered, tweaked, and retried, continuously, until the right outcome was realized and documented; yielding the flawless self-perpetuating machine that is Bridgewater today. This process/philosophy became the centerpiece to Bridgewater’s “systemized approach to investing;” a philosophy that resulted in an accelerated progression toward product/market fit. Today, Bridgewater’s black-box computers, programs, and systems parse over 100 million datasets en route to each trading decision—establishing the economic moat that every business seeks and standing as a fantastic case study as to the importance of fully cohesive operations strategies. First, he hired only hyper-intelligent, independent thinkers whom he trusted to routinely challenge his reasoning and investment theses. Next, he established a culture of “radical truth and transparency”, which he describes as a culture of honest, open, and aggressive disagreement. And finally, he established an “idea meritocracy”—i.e., an environment in which people’s investment ideas were weighed only in proportion to their merits, without the value weighting afforded to rank, title, or seniority. Tangentially, Dalio also pioneered a process he called “error logging” whereby traders had to systematically record, diagnose, and re-refer to any and all errors previously made, as a way to systematically minimize repeats of “unforced errors” for the rest of their tenure at Bridgewater. Team composition-wise, Dalio implemented process innovations whereby each employee had to have his/her stats (strengths, weaknesses, accomplishments, failures, psychometric test results) on physical baseball cards and electronic tables, openly visible to the firm. All this as a constant prompt for his employees to take seriously the task of assembling well-balanced investment teams as a way to make up for individual shortcomings. 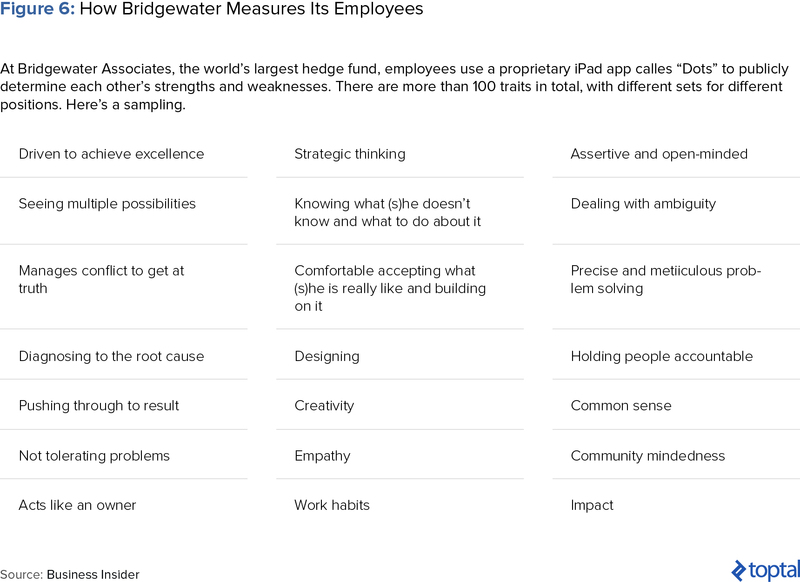 Once Dalio’s operations strategies were fully implemented and its self-perpetuating, continuous improvement mechanisms running at steady state, Bridgewater went on to enjoy explosive success. Between 1985 and 1988, Bridgewater’s initial $5 million had ballooned to $180 million, which subsequently grew to $4 billion by 1995, and $32 billion by 2000. Bridgewater had finally achieved product/market fit and sustainable scalability. The final framework in our toolkit is comfortably the easiest to theorize but hardest to effect. According to renowned venture capitalist and entrepreneur Peter Thiel, “when we think about the future, there are two types of progress: horizontal progress, defined as going from 1 to n, or vertical progress, defined as going from 0 to 1. Going from 0 to 1 (vertical progress) represents a step-function jump so material that it can only be brought about by radical innovation or technological leaps. Envision what the smartphone did to the analog phone, what Google did to query-based search, or what the word processor did to the typewriter. These innovations tend to bring about both drastic changes to the incumbent ecosystem and unfathomable returns to its purveyors. Within the otherwise turbulent world of investing, Dalio was the architect of three separate 0 to 1 innovations; innovations that established, conclusively, an insurmountable advantage in his markets, and cemented Bridgewater as one of the greatest investment institutions of all time. The first of these innovations was the “alpha overlay”—a principle that involves establishing a “risk-neutral” benchmark position while deviating from it with measured bets. More specifically, with the alpha overlay, the beta (passive exposure) and alpha (active exposure) are separated, with further returns amplification being derived by overlaying more diversified portfolios of alphas toward an optimal mix. The commercialization of this innovation yielded Bridgewater’s first and best performing flagship fund, its Pure Alpha Fund, designed to be a “diversified alpha source” to Bridgewater’s L.P.s that invests across groups of asset classes. The second step-function innovation was Dalio’s discovery, creation, and commercialization of inflation-indexed bonds as a new asset-class. At the Rockefeller Foundation’s request in the ’90s, Dalio had to engineer a portfolio that would return exactly 5 percent above the U.S. inflation rate. Given there were no U.S. inflation-indexed bonds then yet in existence, Dalio leveraged a portfolio of foreign inflation-indexed bonds with the currencies hedged back to the U.S. dollar. It was on the back of this that he designed the first portfolio of global inflation-indexed bonds engineered to have the same expected return as equities but with less risk and a negative correlation with bonds and equities over the long term. On the back of his success with this asset class, Dalio went on to advise the U.S. government on how to structure the country’s first U.S. inflation-indexed bond and issue. Dalio’s third 0 to 1 innovation was in his discovery of risk parity and the creation of his second flagship fund, the All Weather Fund. This discovery inadvertently came about as he attempted to design a risk-neutral personal trust for his family; neutrality that effectively controlled for growth and inflationary swings and pressures over time. He accomplished this by marrying four different investment strategies and constructing an asset mix that maintained parity in the relevant economic environments (rising growth with rising inflation, rising growth with falling inflation, and the inverse). Ten years later, Dalio would be managing close to $80 billion in his All Weather Flagship Fund. Over the years, much of Dalio’s incredible success has been attributed to a combination of his intellect, investment acumen, and team’s quirky culture. I believe, however, that this story grossly undersells the scope of the man’s vision, the precision of his execution, the genius of his innovations, and the prescience of his technological bets. Nothing of his organizational design (people, culture, and composition), the singularity of his systems, the pioneering ethos that took him into big data and artificial intelligence—nothing of these attributes was by mistake, but by deliberate design and creation toward full organizational and system congruence. So whether you are a startup or an established business, a search fund or a hedge fund, I hope this article has helped demonstrate (through its various frameworks) that business, first and foremost—especially when reduced to its first principles—is, at its core, simple. And second, that these principles are universally applicable to almost every sort of business imaginable. Always begin with your discipline’s governing dynamics and you’ll hardly go wrong. Happy building! What does the term big data refer to? Big data refers to extremely large data sets and, often, the associated ability to computationally analyze it to reveal patterns, trends, and associations, especially relating to human behavior and interactions. Machine learning technology is a subset of artificial intelligence (AI) and its technological application that affords systems the capacity to automatically learn and improve from experience through pattern recognition, where big data is available, without being explicitly programmed. What is the definition of a hedge fund? An investment fund, executed by a professional investment management firm that pools capital from accredited or institutional investors to invest in a variety of assets, often seeking to magnify investment outcomes by using leverage, complex portfolio-construction and risk-management techniques. Hedge funds take calculated bets on a wide variety of asset types and classes via investment strategies aimed at maximizing absolute returns, irrespective of market volatility. Hedge funds typically earn “2 + 20”: an annual charge of 2% on assets under management, plus a 20% performance fee on profits earned. This article is extremely well done. Describing the phenomena that are Bridgewater and Dalio’s Principles so clearly and methodically is no easy feat. Also loved the overlay of other frameworks and thinkers. Looking forward to the next feature.